The political situation in the Czechoslovakia in the ’60s was to some extent a boon to local filmmakers, since they had ready access to resources (with no producers to woo), and an endless source of inspiration in the pervasive bureaucratic madness. The Czech films in the years leading up to the late-’60s’ “Prague spring” are at once satirical and celebratory, embracing the nation’s Bohemian roots and dark sense of humor, while also acknowledging the hellishness of the system. But these films didn’t escape censorship entirely; many were banned almost as soon as they were made. The movement toward a more expressive, low-to-the-ground cinema came later to Czechoslovakia than it did to other European countries, but it’s a miracle that artists facing such scrutiny were ever able to produce work as varied and innovative as the six features in Eclipse’s remarkable, essential Pearls Of The Czech New Wave box set. The four-disc set brings us six rather-neglected classics from the politically-fueled era of the late '60s, helmed by such visionary masters and mistresses as Vera Chytilova, Jaromil Jires, Jiri Menzel, Jan Nemec, and Evald Schorm. We begin with the anthology flick Pearls of the Deep (1965), which was crafted by all five directors, with the only similarities here are the fact that all of the film's chapters are based on works by writer Bohumil Hrabal. There are short films here about motorcycle races, folk artists, flirtation, celebration, and dying, rendered in color and black and white, and with a mix of lyricism, low comedy, and stark reality. It’s the rare omnibus film with no real weak spots, and it makes a fine introduction to the diversity and artistry of the rest of this set, which contains one feature each from the Pearls Of The Deep directors. On Disc Two, we have a double feature. First, Ms. Chytilova returns to bring us what she is probably best known for: the charming classic Daisies (1966), a surreal tale of two completely spoiled and bored girls named Marie (Ivana Karbanova and Jitka Cerhova) that is an utter delight — and is quite possibly the best entry in this entire set. 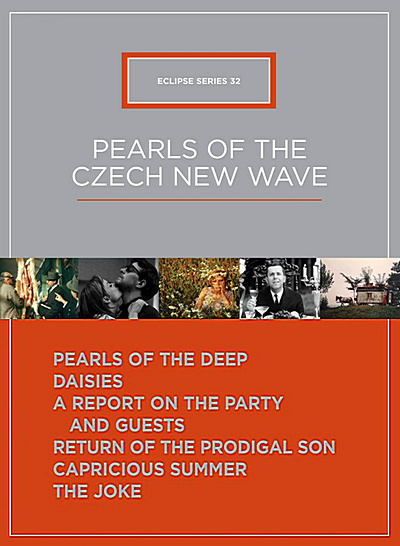 Mr. Nemec's A Report on the Party and Guests (another from 1966) — a yarn wherein a picnic becomes a bizarre lesson about the pecking order of politics once a couple of peculiar individuals show up — became a unpopular item with the Czech government at the time of its release, and managed to get itself banned for its parables of real life repression. Disc Three gives us a peek at Evald Schorm's Return of the Prodigal Son (1967), a bleak drama about a successful married man who suffers from a horrible depression that constantly takes him back to a decidedly peaceful asylum, where he forms a friendship with another depressed individual. The fourth and final disc in this set bring us two more offerings from Jiri Menzel and Jaromil Jires: Capricious Summer (1968) and The Joke (1969). The former title (from Mr. Menzel) follows the entertaining plight of three middle-aged men who encounter a circus performer and his lovely assistant; the latter (courtesy Mr. Jires) focuses on the humorless absurdity of the Communist Party, with a member being ousted following a political joke, only to wind up in prison, where he begins to devise a recipe for revenge against the ex-pal who put him there.